This is the rear entrance of Bar Brutal. Don’t use it, like I did! This is the most amazing white wine! This is the most amazing octopus dish I have ever had! 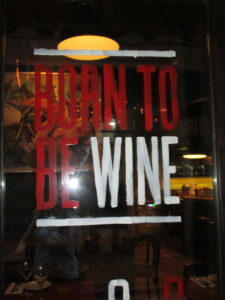 I love this on the back window of Bar Brutal! I am a very fussy white wine drinker. Just to give you a reference point, I turn my nose up at most Pinot Grigio’s, Chardonnay’s, Most Sauvignon Blanc’s, in other words…I’m very picky when it comes to white wines. However, I love most Chablis! I also love a french chardonnay that is not heavily oaked, like a Pouilly Fuisse, (Louis Jadot is an easy to find at any liquor store). What I loathe is a heavily oaked, California chardonnay. Some people who agree with me, call them “butter bombs”. Sorry, Kendall Jackson, but you are one of the worst offenders. I will say though, that these chardonnays make a great sauce when you need to add white wine to create a buttery white wine sauce, such as in my family’s favorite garlic shrimp recipe. One California chardonnay that I do love is, Jordan Chardonnay. So, now that you know me a little better, you can imagine my trepidation and fear when, in a Barcelona wine bar the other night, the waiter suggested a white wine on their menu. I responded with, “Uh, I’ll try this Catalonian red, thanks…” But after thoroughly enjoying my red wine, I became inquisitive about the white. I asked the waitress about the wine. She raved about it. 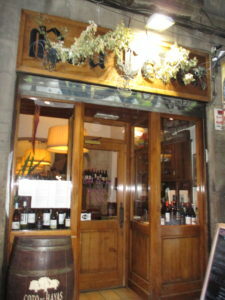 She explained that is was an all organic, totally natural wine from a winery in nearby Catalonia. She said it was more like a red wine than a white wine, which thoroughly confounded me… So I took a chance and ordered it. I then asked the waitress for a recommendation for my dinner course. She recommended the octopus. I flinched, and said, “The octopus? Really?” You see, I haven’t been a big fan of the octopus that I’ve had in the past. All I remember from my last few attempts at enjoying octopus were some very chewy tentacles. But I wanted to look sophisticated, so I said, “Sounds great! I’ll try it!” secretly flinching inside. (Honestly, I was just relieved that she didn’t recommend the brain that was on the menu!). She then added, “It will pair really well with the wine you ordered.” I’m a sucker for a good pairing, so I went for it. Fast forward to my first sip. My first taste was of course on the tip of my tongue. This white wine reminded me of my beloved Chablis. It was light. It had very little flavor. But it was light weight and light in flavor in an excellent way. Just what I like in a white wine. But then at the finish, it was black pepper! Black pepper! I am not kidding! This was the most unique, unexpected flavor! I took a nibble of green olive. Now mind you, I had thoroughly enjoyed my light, fruity Catalonian red wine with my olives, but the pairing of the green olive with this lightly flavored white wine, with the black pepper finish, this was truly an amazing experience. And then the octopus arrived. My first thought was, thank goodness! No tentacles! The octopus meat was sliced, and I would have never even recognized it as coming from an octopus. It honestly could have passed for chicken! 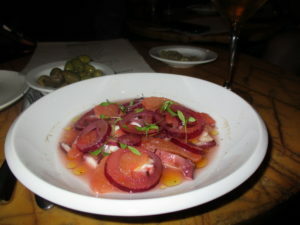 The octopus was in a dish with grapefruit slices, and onions, and I believe radishes? In a sauce of grapefruit juice. It was simply delicious! But the pairing of this unique and delicious white wine with this dish was simply divine! It was the perfect refreshment on a hot Spanish day. I honestly wish I could give you all a bite. I highly recommend if you are ever in Barcelona that you visit Bar Brutal and try this fabulous pairing of octopus and this unusual and delicious white wine! Please visit Bar Brutal at Carrer Princesa, 14 Note: Bar Brutal does not open until 7pm.